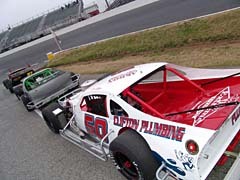 The ARCA RE/MAX Series and the IBG-PASS Pro Stocks (Super Late Models) have already crowned champions for 2005. The NASCAR Whelen Modified Tour, NASCAR Whelen Southern Modified Tour and CRA Super Series have not. The USAR Pro Cup Series has their Championship portion of the season underway after deciding a titlist in their Northern and Southern divisions during the regular season. Fans are able to vote for the Most Popular Driver award in their favorite series by visiting www.speed51.com and casting their ballots. There is a limit of one entry per person per day when it comes to voting. Voting has been tight throughout the short track community for these awards. Early reports are that there are several extremely close battles between drivers and not one driver has come close to clinching the award yet. So whatever you do as a fan this month could make the difference for the entire year. Eddie Hoffman could win the CRA Super Series MPD Award. But one thing that hasn’t been decided in any of those forms of racing is who will be the fans choice for Speed51.com’s Most Popular Driver. The popular short-track racing website is sponsoring and administrating the voting for all of those tours in 2005. The fans will continue to have their voices heard, but time is running out. All of the contests, except for USAR Pro Cup Northern and Southern Divisions, will wrap up on November 1st. The USAR Pro Cup portions of the balloting will take place until December 1st. Who will win the Southern Modified Tour Most Popular Driver Award. Speed51.com also sponsored the Most Popular Driver Awards at this year’s Bonjangles Summer Shootout at the Lowe’s Motor Speedway. That contest was one of the most popular MPD programs ever. Winners included Chrissy Wallace, daughter of NASCAR Nextel Cup competitor Mike Wallace, Legends driver Ryan Jernigan and nine-year-old Nicholas Stroupe.